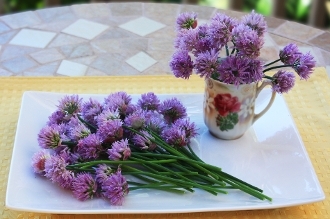 Aromatic, flavorful lavendar-colored chives blossoms. Round shaped bunches of tiny flowers with a long stem. Strong Chive flavor and aroma. Garnish poultry and steak dishes! Typically available from March through July.